Karolinska Institutet is one of the world’s leading medical universities. Its vision is to significantly contribute to the improvement of human health. 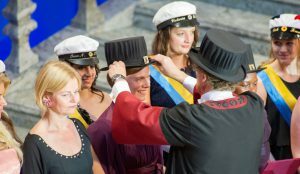 Karolinska Institutet accounts for over 40 percent of the medical academic research conducted in Sweden and offers the country’s broadest range of education in medicine and health sciences. The Nobel Assembly at Karolinska Institutet selects the Nobel laureates in Physiology or Medicine. The Press Office at Karolinska Institutet handles inquiries from the media about press images and contact information to our university management, scientists, and other experts. The press phone is staffed from 8am to 8pm CET on weekdays, and from 9 am to 5 pm CET on weekends (outside office hours only for urgent requests). On Swedish public holidays we are closed. Emails are answered during office hours. Conferment ceremony, Stockholm City Hall, May 2014. Credit: Ulf Sirborn. A new study shows that there is a very limited regeneration of cells in the brain of patients diagnosed with multiple sclerosis (MS). These findings underline the importance of treating MS at an early stage of the disease progression, when the affected cells can repair the damage as they are not replaced by new ones. The results are published in the journal Nature by researchers from Swedens Karolinska Institutet and Uppsala University. Subpopulations of oligodendrocytes, myelin-producing cells in the brain that are targeted by the immune system in multiple sclerosis (MS), are altered in MS and might therefore have additional roles in the disease than previously described. The results are published in the journal Nature, in a study led by researchers at Sweden’s Karolinska Institutet and University of Edinburgh in the UK. In recent years access to drugs and vaccines has been increasing in many African countries, but the systems for monitoring treatment effects and reporting side-effects require further development. Karolinska Institutet in Sweden will now lead an international collaboration project on pharmacovigilance – drugs safety – in four countries in East Africa. An infant’s scores on the so-called Apgar scale can predict the risk of a later diagnosis of cerebral palsy or epilepsy. The risk rises with decreasing Apgar score, but even slightly lowered scores can be linked to a higher risk of these diagnoses, according to an extensive observational study by researchers at Karolinska Institutet in Sweden published in The BMJ. A new study from Karolinska Institutet shows that the same mechanisms behind the beneficial effects of exercise training on the brain also help to counteract fat and to strengthen the immune system. The results, which are published in the journal Cell Metabolism, can ultimately give rise to new obesity and diabetes drugs. Being screened again after the age of 60 reduces the risk of cervical cancer in women who have previously had abnormal smear tests and in women who did not have smear tests in their 50s, researchers at Karolinska Institutet show. The study, which is published in PLOS Medicine, is important for setting guidelines on the age at which screening can be discontinued. A single dose psychological intervention including the computer game Tetris can prevent the unpleasant, intrusive memories that develop in some people after suffering a traumatic event. Researchers have been able to demonstrate how the survivors of motor vehicle accidents have fewer such symptoms if they play Tetris in hospital within six hours of admission after also having been asked to recall their memory of the accident. The results of the study, which was conducted by researchers at Karolinska Institutet with colleagues at Oxford University and elsewhere, are published in the journal Molecular Psychiatry. Children born to mothers who gained too little weight during pregnancy were at increased risk for schizophrenia and other non-affective psychoses later in life, according to new epidemiological research from Karolinska Institutet in Sweden. The findings, which are published in the journal JAMA Psychiatry, confirm the results of several important historical studies that showed a link between exposure to famine while in the womb and increased risk of schizophrenia later in life.